Rev. Steven Aucella is a 2013 graduate of Andover Newton Theological School and is ordained in the United Church of Christ. As part of his training, Steve served as a student pastor at First Congregational Church UCC in Stoughton and as a chaplain intern at New England Baptist Hospital in Boston. 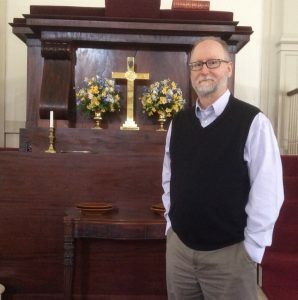 Steve has also served as a guest preacher in the UCC, mostly covering the South Shore and Cape Cod, with occasional trips north of Boston, and as co-pastor at Promise Church in Weymouth. Steve also serves on the Southeast Area Missions team for the Massachusetts Conference of the United Church of Christ. The team recently cast a light on the human trafficking issue and its impact on the South Shore, and has organized a public forum that focused on the opioid crisis in Massachusetts, hosted here at New North Church. Steve is also a member of the Hingham Hull Interfaith Religious Leaders Association. Steve lives in Marshfield with his wife Jody Regan, an artist who also teaches middle school math in Norwell, and their daughter Kate, who is a senior at Northeastern. Their cats Maggie and Fred keep things interesting at home. Office Hours: Generally, the office is open on Wednesdays and Fridays from 9:00 to 5:00 and sometimes on Thursday afternoons. Contact Steve directly to verify he is going to be in on a given Thursday. E-mail and the telephone always work too.